The Museum is dedicated to Paolo Orsi, the great archaeologist from Rovereto, Trento (1859-1935). An expert of Hellenic and pre-Hellenic civilisations, he worked for years in Sicily; in Syracuse, he arranged the first Archaeological Museum in Piazza Duomo, a task which was later continued by another great archaeologist, Bernabò Brea, in the post-war period. As the exhibition space proved insufficient to house all the material from the great investigation and campaigns in the main archaeological sites of eastern Sicily, the new Museum was begun in 1927, with financial support from the Development Fund for Southern Italy (Cassa del Mezzogiorno) and the Regional Ministry for Cultural and Environmental Heritage, and opened in 1988. 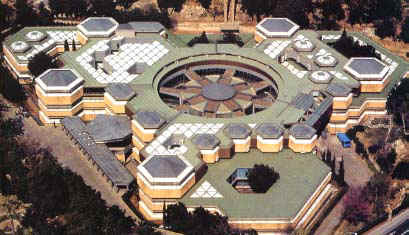 Built in the park of Villa Landolina by the architect Franco Menissi, it is the most important and innovative museum in Sicily, and one of the foremost in Europe. In its 9,000 sq m of exhibition space on two floors, the Museum displays 18,000 archaeological finds from the city of Syracuse and from the eastern regions of the island. The museum extends horizontally and is arranged on two floors. It houses 3,000 sq m of storerooms and laboratories in the basement, and the exhibition rooms on the upper floor. In the central body, a hall leads into the Auditorium, equipped with modern audiovisual systems for the projection of films and slides, and also used for cultural and information activities. The chronological succession of exhibits in the various sectors starts from the prehistoric and protohistoric ages, from the Paleolithic to the Neolithic, and continues with the Copper Age and different stages of the Bronze (early, middle, late and last) and Iron Ages. The following sector displays material from the first Greek colonies of Naxos, Mylai, Zancle, Katane and Leontinoi, the largest space being devoted to the Doric colonies of Megara Hyblaea and Syracuse. Of extreme historical and artistic interest are the tomb furnishing from the Syracusan necropolis, with a vast collection of Corinthian, Ionic, Rhodian, Attic and Etruscan imported pottery. Next are the architectural terracottas from the urban and extra-urban sanctuaries of Syracuse, from the temple of Apollo, the Athenaion, the Ciane Sanctuary, the temple of ApolloTemenites, the two sanctuaries of Artemis at Scala Greca and Belvedere and the temple of Olympian Zeus on the banks of the Anapo. There is a rich collection of religious terracottas manufactured in Siceliot workshops in the 5C and 4C BC, from Gela, Agrigento, Camarina and other eastern sites of the island. Dating from the 2C AD, also known as “Venus Landolina” from the name of the archaeologist Saverio Landolina, who discovered it in a nymphaeum in the Syracusan quarter of Achradina. 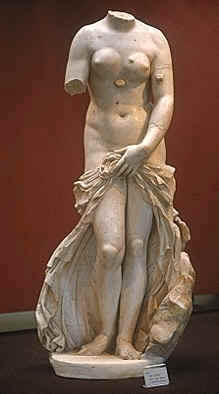 The marble statue is a Roman Imperial imitation of a Rhodion original. 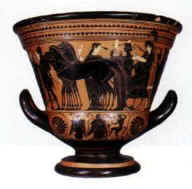 One of the Attic vases from the necropolis, black-and red-figured and datable from the 5C BC. The vases provide valuable information on Greek ceramics ranging from the 8C Bc to the Hellenistic age. 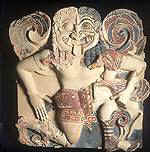 Detail of a bright polycrome terracotta frieze with the Gorgon (first half of the 6C BC). Bronze head of Medusa, from Palazzolo Acreide (mid-2C BC). Small bronze of an offering athlete holding a phiale in his right hand, from Mendolito, near Adrano, probably a smaller copy of a great votive statue; attributed to Pythagoras of Rhegium (c 460 BC). 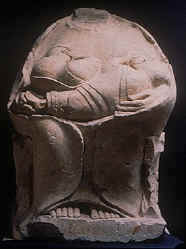 Limestone “Kourotrophos”, a headless goddess breast-feeding two twins with adult faces. 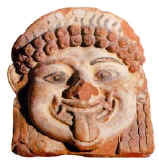 From Megara Hyblaea, northern necropolis (550 BC). Gorgon from the Temple of Athena, Syracuse, 570-550 BC.